Apple announced its Apple Watch Series 3 today at its Keynote event at Steve Jobs Theatre in Cupertino, California. The company launched the new Apple Watch Series 3 before the launch of the new iPhone 8, iPhone 8 Plus and the iPhone X at its first event in Steve Jobs Theater. The highlight of the new Apple Watch Series 3 is LTE or cellular connectivity. This means you can receive and make phone calls even if you don’t have your smartphone with you, although users will need a smaller, electronic SIM for this. Apple CEO Tim Cook at the event claimed that Apple Watch is the “number one watch in the world”, beating out the likes of Rolex, Fossil, and Omega. He also said that the device experienced 50 percent year-over-year growth. 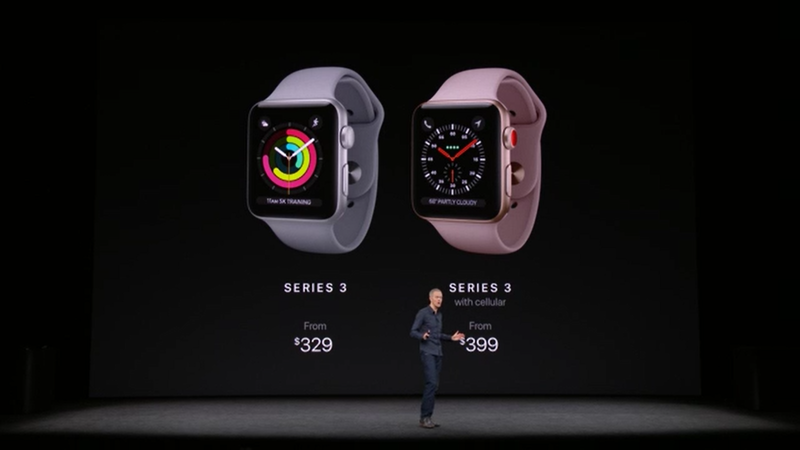 The new Apple Watch Series 3 is priced at $399 with cellular connectivity and $329 without it. Pre-orders for Apple Watch Series 3 start on September 15th and it will be available for sale on September 22nd. The Apple Watch Series 3 includes a new dual-core processor. Apple says it is 70 percent faster than the previous generation and hence it allows Siri to actually talk on your watch. 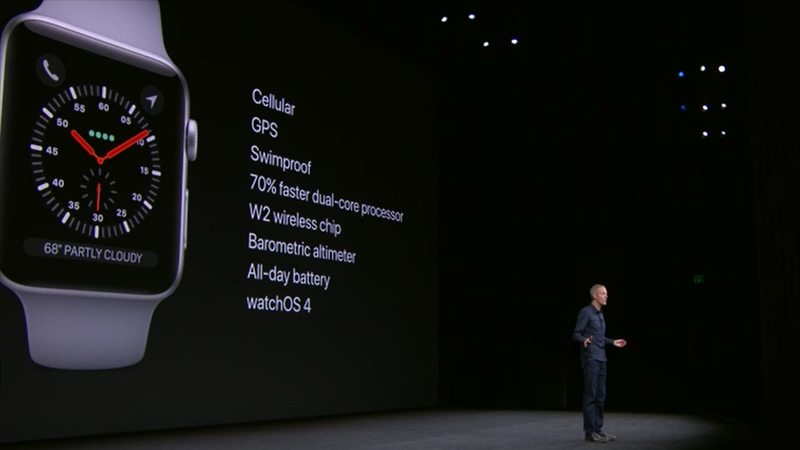 It has an all new Apple Watch OS 4 with a lot of added features. Moreover, the new W2 chip is said to deliver 85 percent faster Wi-Fi connectivity while being 50 percent more power efficient. This will make the watch’s battery to last long as cellular connectivity drains the battery more rapidly. Apple claims the watch should give up to 18 hours of battery life. Coming to the connectivity, apart from Wi-Fi, Bluetooth, and GPS, the new Apple Watch features LTE connectivity as well. It shares your phone number with your iPhone via an e-SIM. It doesn’t feature a conventional antenna, rather the display of the watch serves as the antenna for 4G LTE and 3G. Design wise, the Series 3 is the same size as the Series 2, with its back expanded by 2.5mm. This is the first smartwatch from Apple that features true LTE connectivity without using the phone. However, Apple isn’t the first smartwatch maker to feature LTE modem in its device. To recall, Samsung’s Gear S3 smartwatch also has both GPS and LTE connectivity. The pricing of new Apple Watch Series 3 starts at $329, however, this model does not support LTE. With LTE connectivity, the pricing starts at $399. The pre-orders for new Apple Watch begin on September 15, however, it will start shipping from September 22 in the US. Along with the Apple Watch, new Watch bands including those from Nike and Hermes were also announced at the event.